Sometimes it's hard to get a touchy-feely look for both guys and gals with the same stamp set, without it looking effeminate, but I think Snuggles and Smooches does the trick. All I did was switch out the color palette, and it was a done deal. 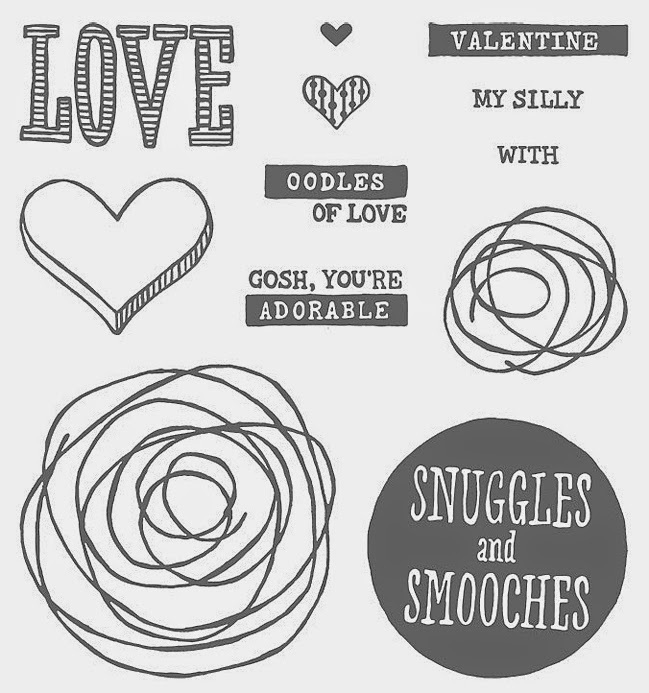 The Snuggles and Smooches stamp set is available only in photopolymer (fabulous for easy image layering), so make sure you've got some Clear Blocks to use with it. Stampin' Supplies: Snuggles and Smooches stamp set, Whisper White card stock, Tempting Turquoise ink pad & card stock, Soft Sky ink pad & card stock, Island Indigo ink pad, Melon Mambo ink pad & card stock, Pink Pirouette ink pad & card stock, Rose Red ink pad, Decorative Dots Textured Impressions Embossing Folder, Sweetheart Punch, Itty Bitty Accents Punch Pack. Guy Greetings: Happy Birthday Like a Sir! I didn't even know this was a thing, but when I showed my daughter this card, she texted me back and said, "Like a Sir!". I thought she was just being naturally clever, but apparently she'd had a little help from the interwebs. "Like a Sir" comes from a meme I somehow missed, probably because I don't spend my life on tumblr. Hilariously enough, I made this card for my son...who plays Minecraft...and I found THIS "Like a Sir" parody when I was looking up the meme. So, for the inside of this card, I'll now have to write "Celebrate Like a Sir!". Ahhhh, synchronicity. 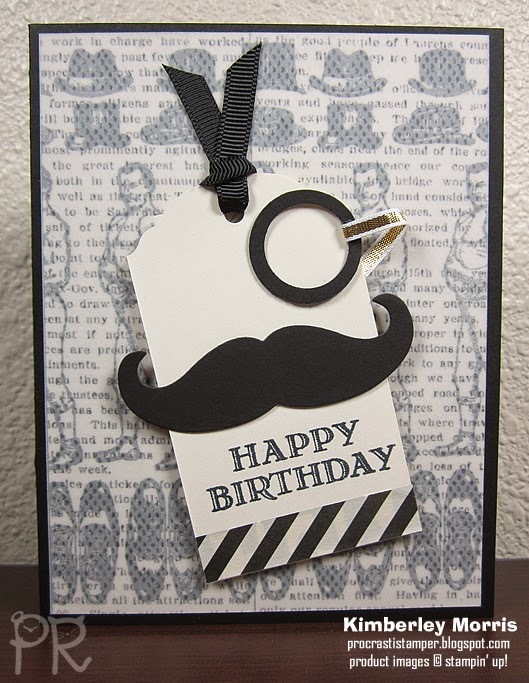 Stampin' Supplies: Guy Greetings stamp set, Mustache Die, Typeset Designer Series Paper, Vellum Cardstock, Basic Black Cardstock, Very Vanilla Cardstock, Transfer Adhesive Sheets (to attach vellum), Memento Tuxedo Black ink pad (of course, because a sir wears a tuxedo! ), Ornate Tag Punch, 3/4" Circle Punch, 1" Circle Punch, 1/8" Basic Black Tafetta Ribbon (different from the one shown), 1/8" Gold Ribbon, Mini Glue Dots, Stampin' Dimensionals. By the way, the mustache and monocle design was not my original idea. 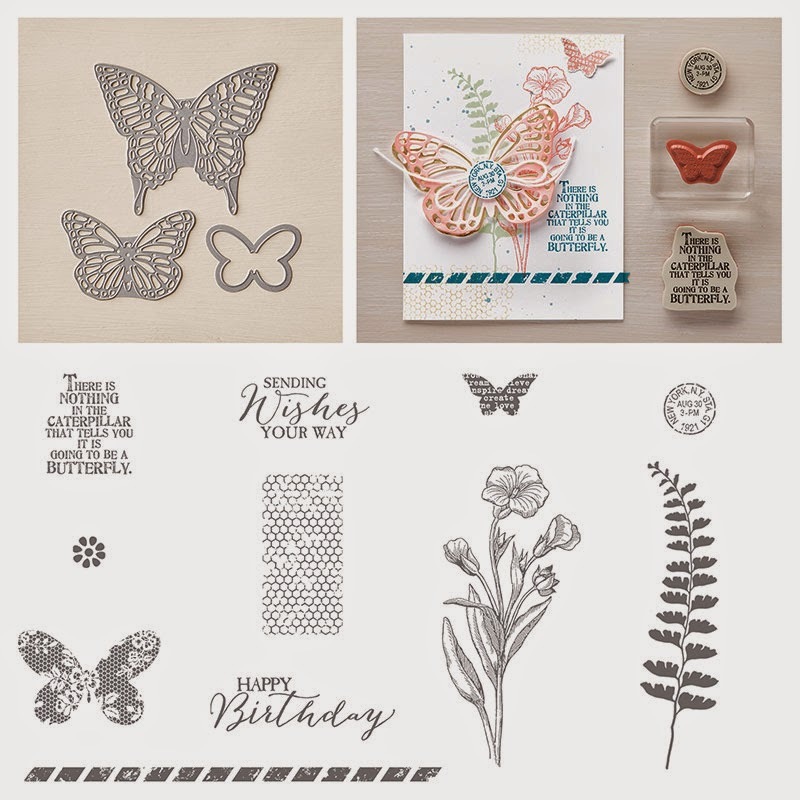 It was shared by a fellow demonstrator, on a demonstrators-only gallery called Stampin' Connection, which is hosted by Stampin' Up!. Just another of the exclusive perks you can enjoy when you Become a Demonstrator! 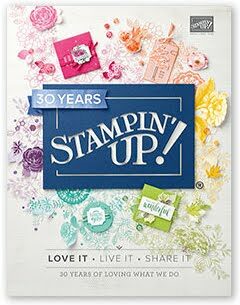 UPDATE: ordering demand for these products has caused some slowing on the Stampin' Up! web sites. Please be aware that currently, you may experience a slow shopping process in my Online Store. SHOP IN MY ONLINE STORE NOW!!! Please note that Basic Black and Basic Gray inks are listed as retiring, only because they will be returning in the new catalog in improved, archival formulations. Stampin' Up! 's Butterflies Have Landed with a SPECIAL OFFER! Order the Butterflies Thinlits Dies (shown above) at 15% OFF!!! 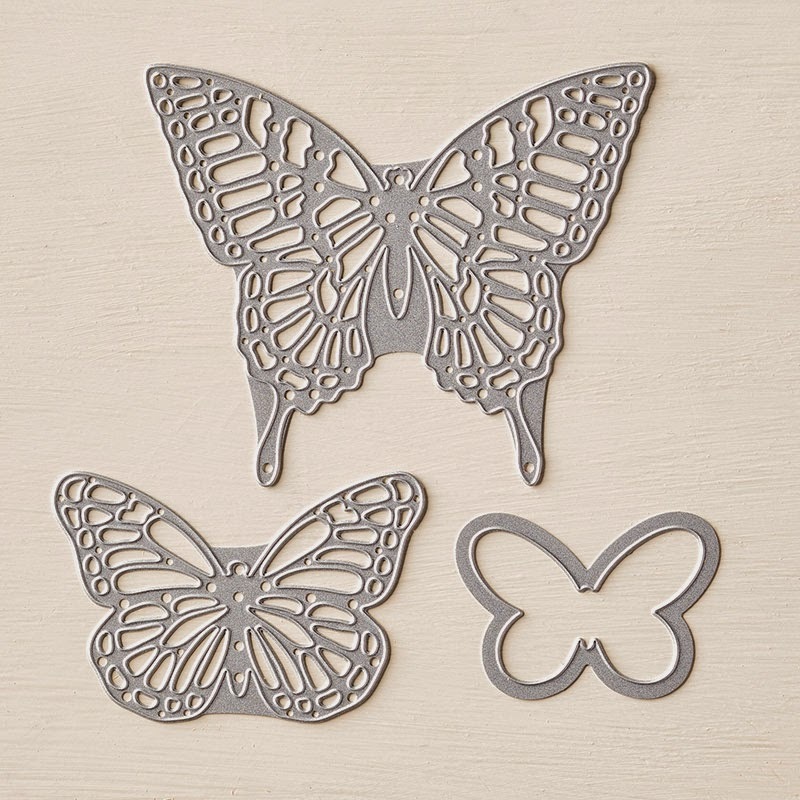 Just for reference, the two larger dies stand alone, but the smallest butterfly die coordinates with the butterfly image in the stamp set, to make a perfect cut-out. There is also a smaller butterfly in the stamp set that can be punched out with the Bitty Butterfly Punch. The circular date image can be punched out with the 3/4" Circle Punch, and the tiny solid flower image is perfectly framed by the round label in the Little Labels Punch Pack. And on a final note, if you ARE getting the coordinating stamp set, I recommend photopolymer for this one, because it makes layering the images SO much easier! Click on Banner to SHOP NOW!! !